In love with designing and crafting jewelry - I wanted to share my creations with you all. Each piece is designed and crafted by me with love and passion at my Brooklyn Apartment. My jewelry is crafted from colored copper parawire and Swarovski or Thunder Polish Crystals. In the future, I look forward to experimenting with other materials. I hope you enjoy each piece as much as I did creating them. New jewels will be updated here and can be purchased at my online shop! Your necklaces are absolutely beautiful. I want to buy one!!! I love you jewelry, they are beautiful. Thanks Barbara - that means a lot to me! dear misha :) i love you big sis & i hope your jewlry continues to flourish & grow just like you ! Peace Queen...I am viewing your blog from my home...could you please direct me to your online shop...Peace/Blessings! 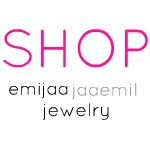 Hi Sweetga Brownin - if you click on the picture above or in the side bar that says Shop Emijaa Jaaemil - it will take you to my online jewelry shop!